C-ville’s Day of R+R is the capstone event for Common Ground’s 2018 spring fundraising effort. This donation-based fundraiser is an opportunity to try all of Common Ground Healing Arts’ services – yoga, massage, acupuncture, and meditation – in addition to other restorative, relaxing remedies in one day. Acupuncture (just the ear points) and body work including massage, Zero Balancing, CranioSacral Therapy & Reflexology will be offered 12:00-7:00pm. 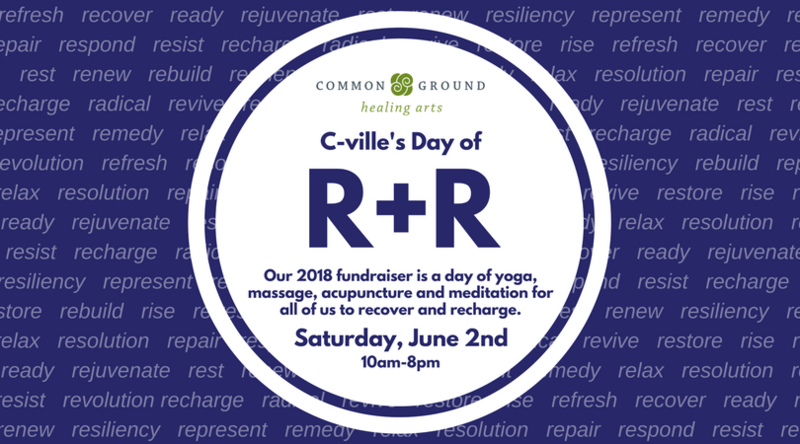 C-ville’s Day of R+R will take place at Common Ground Healing Arts on the second floor of the Jefferson School City Center. Parking is free. For more information, visit commongroundcville.org or call 434-218-7677. Common Ground Healing Arts is Charlottesville’s nonprofit wellness center. Common Ground offers yoga, massage, acupuncture, and meditation on Pay-What-You-Can ranges at the Jefferson School City Center, and takes services at no charge to the Fluvanna Correctional Center for Women, Sentara Starr Hill, Westhaven Community Center, Blue Ridge Juvenile Detention & Big Brothers/ Big Sisters. In the past year, Common Ground has served more than 2,500 unique clients with a total of over 13,500 visits. Please show YOUR support for affordable, accessible wellness in Charlottesville by making your spring fundraising donation below – either as a one-time or recurring gift! Set-up Your Recurring Monthly Donation to Common Ground! Thank you to C-ville’s Day of R+R Sponsors! Conveniently located about 17 miles northwest of Charlottesville, Virginia, Akasha Retreat Center is a special place to gather and grow for friends, families and other groups who want to enjoy an intimate and peaceful retreat with each other in a serenely beautiful location. Broadcasting as WTJU 91.1 FM in Central Virginia, WTJU presents original, rich, and diverse programming of music and other forms of expression free from the direct constraints of commercial interests, reflecting the broadest educational goals of the University. Common Ground could not exist without community support from area businesses and organizations. THANK YOU to our sponsors for supporting Common Ground, and making wellness affordable and accessible in Charlottesville. Scroll Down to Learn More about Each Session! As our community and our country transition to greater awareness of our racial divides, much work remains for each of us to do on an individual, personal level. 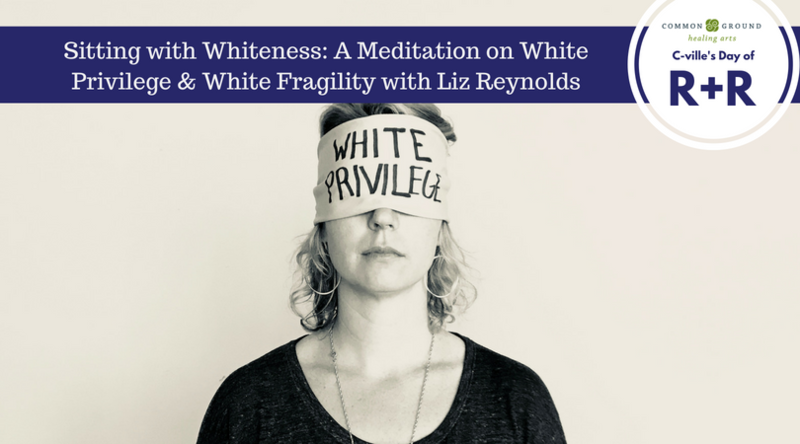 In this 90-minute meditation-centered session, we will explore the internal, emotional terrain that white people traverse, often unconsciously, when confronted with race and the lived experience of African-Americans. By making space for feelings (guilt, shame, anger, defensiveness) that can arise for white people whenever racial disparity emerges in our daily life, greater space around and freedom from these emotions becomes possible, allowing for a more dynamic and powerful response to injustice in our environment. In this session, we will explore the connections between one’s personal meditation/spiritual practice and the pursuit of racial justice, emphasizing the suffering that exists in the life of every American as a result of racial division and inequity. All are welcome to attend this session of confronting and sitting with difficult emotions; no prior meditation experience is required or needed to participate. Please note: this session is offered completely free. About Josh Li: Dr. Li is a spine surgeon with a dual appointment as Associate Professor in the Department of Orthopaedic Surgery and the Department of Biomedical Engineering at the University of Virginia. 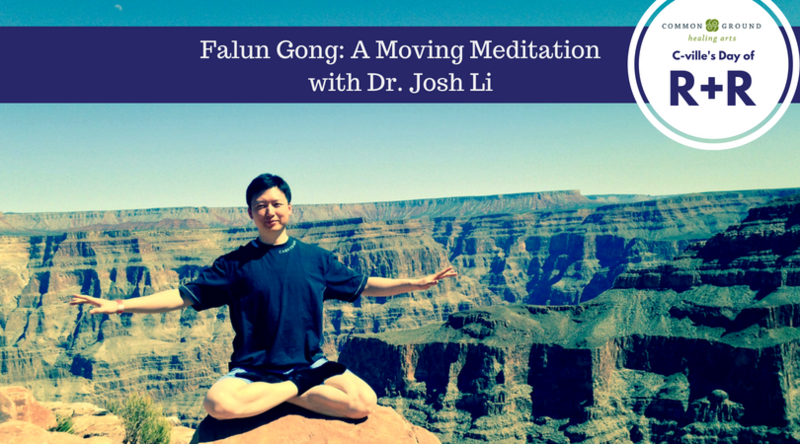 His dream is to combine Western medicine, Oriental medicine and alternative treatment, like Falun Gong, to help and heal patients. Emotional Freedom Techniques (EFT) – more commonly known as tapping – is a simple technique that can be learned in a very short period of time but will, if practiced consistently, stay with you for life. EFT is based on the principles discovered by acupuncture more than 5,000 years ago, but rather than using needles it taps gently on energy points around the body paired with specific mental activities. This combination produces shifts in your brain that will shape your emotional and physical responses to the world around you. 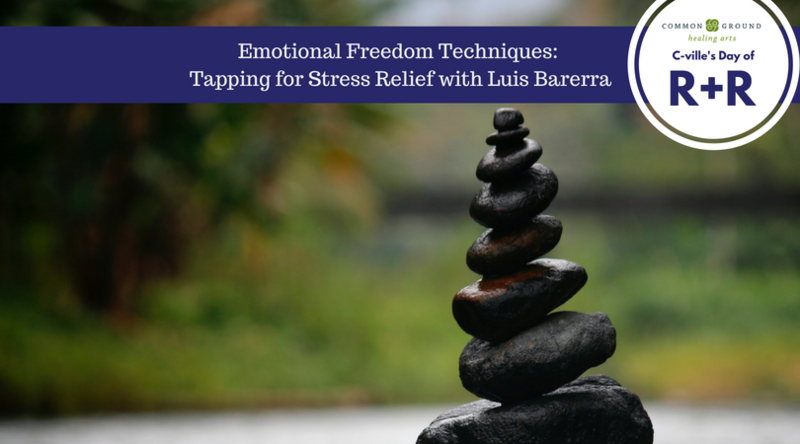 About Luis Barrera: Luis Barrera has been practicing and teaching EFT for more than 15 years. He came across it almost by mistake after a lifetime of traumatic experiences including depression, abuse as a child, and failed marriages and businesses. After training under some of the best in the EFT world his life opened up and he went on to become a QiGong instructor, received training in Vipassana meditation and lived four years in a Buddhist center in Berkeley where he practiced Kum Nye (Tibetan Yoga). He now manages the wood shop in a local non profit dedicated to caring for adults with mental illnesses. AcroYoga blends partner yoga, acrobatics, and Thai massage to explore balance and connection with others. Learn poses and transitions in a safe, controlled manner as you unlock your inner child. No experience is necessary. Bring your questions, curiosity, and any reservations you might have. People are often nervous to try AcroYoga for the first time, but we’re here to keep you safe and help you experience this fun, invigorating practice! 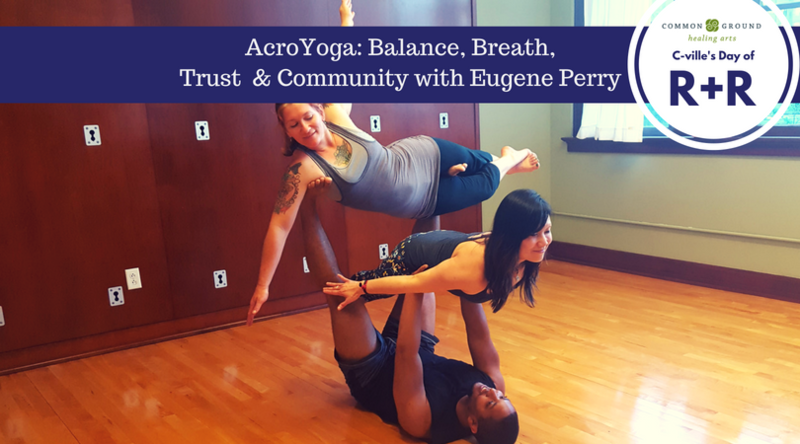 About Eugene Perry: Eugene Perry’s journey through motion brought him to AcroYoga when he was introduced to it by Danielle Lagana. He’s been trained by Ian Nathan and Danielle. Eugene has attended various 3 and 4-day AcroYogaintensive workshops including AcroShare, AcroLove, and Capital Flightfest. Eugene is dedicated to creating a safe environment so that others are encouraged to explore their movement and balance. How can we liberate our minds through journaling? 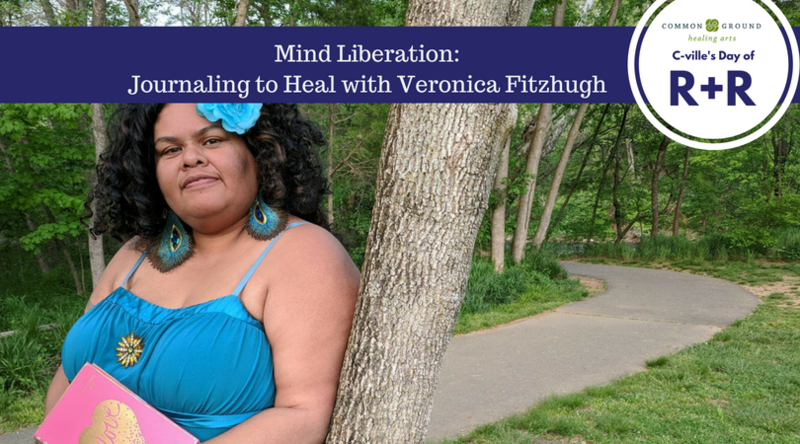 Veronica proposes we can begin this process by being present, creative, kind, spontaneous and dwelling in the possibilities instead of being ruled by the apparent authority of the shame of our past and the anxiety about our future. As we are constantly reborn to this liberation, we release the shrouds of painful histories and no longer relive generational trauma. In this release, we learn to embrace new and perhaps more effective strategies, mindsets, and hopes we can then use for our community liberation. In this session, we will write, explore, and make plans to further apply these liberation characteristics to our personal, professional, and activist lives. About Veronica: Veronica Haunani Fitzhugh, certified life coach and experienced peer support specialist, earned her BA in English Literature from the University of Virginia but is more proud of the friendships she earned through her social justice work in Charlottesville, Virginia. During this gentle class, we will stretch the body and relax the mind. This non-flow class is a great class for beginners through advanced. We will connect to the breath as we bring our focus inward with relaxing music, readings, and guided meditation. No experience or flexibility required. About Benita Mayo: In 2006, during one of many diet & exercise endeavors, Benita was introduced to yoga by her personal trainer. She was drawn to yoga for the physical benefits and didn’t expect it would completely transform her life. She completed her Yoga Teacher training at Sol Yoga in Frederick MD and has additional certifications in Trauma Informed Yoga and Yoga for All. Benita is passionate about holistic health, wellness and life balance; and strives to make yoga accessible to every-BODY. 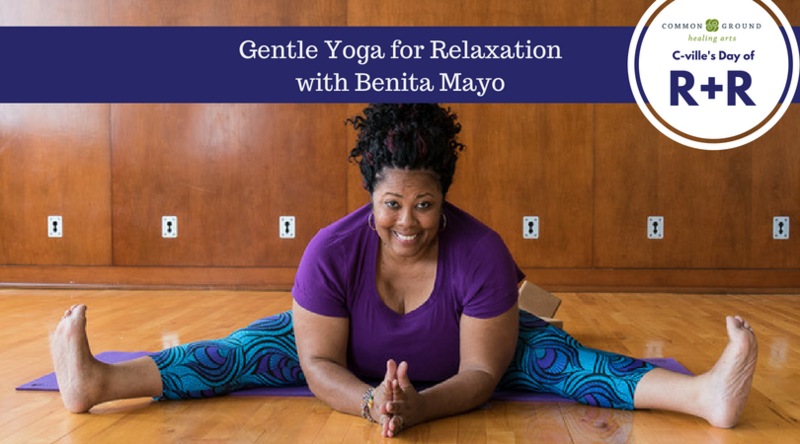 Benita uses her experience as both a larger-bodied yoga student and teacher to partner with her students to make classes welcoming and inclusive. Benita is a native of Virginia and received her BA from the University of Virginia. Benita is a Fine Art Photographer, enjoys traveling and riding her bicycle on the many Virginia trails. Benita teaches Slow Flow, Gentle and Yin. Join us in discovering the ongoing “story of you” through SoulCollage®, a method of self-discovery where you intuitively select “soul stirring” images and create a collaged card. We then contemplate the insights received to support your journey. Together, we’ll get the opportunity to witness and embrace the collective wisdom of our beloved community. Bring magazines and scissors if you have them. If not, don’t worry, we’ll have plenty. About Doreen Bonnet: Doreen is owner of Studio Epiphany. 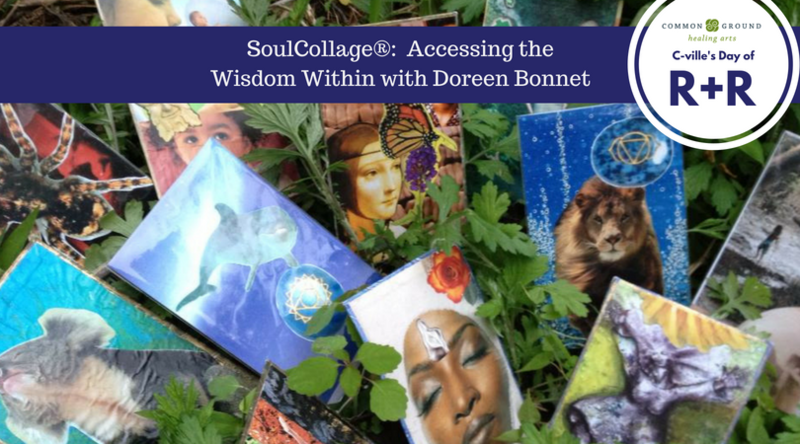 She is a SoulCollage® facilitator, a Jin Shin Jyutsu practitioner, and a birth sister with Sisters Keepers Doula Collective. She is a graduate of the Southwest Institute of Healing Arts, Inner Visions Institute of Spiritual Development, and an ordained minister through Awakening Together, a universal assembly of peers dedicated to recognizing and embracing universal wisdom regardless of the form in which it appears.